High Altitude Platform Market size was estimated at over USD 1 billion in 2016 and is predicted to grow at over 5% CAGR from 2017 to 2024. Increase in global defense spending across various economies for the procurement of advanced defense and surveillance technologies such as UAVs is a major factor driving the growth of the HAP market. Rising terrorist and trafficking activities across the world is contributing towards the substantial increase in defense expenditure. For instance, in October 2017, a sniper attack in Las Vegas accounted for approximately 59 deaths and 527 injuries. Such instances have led to widespread panic and drastically impacted business operations. Additionally, the platforms can provide clear and concise images of objects over a long period of time. Governments in India, UK and the U.S. have initiated grants and programs to aid companies operating in the global high altitude platform market. For instance, the French government has offered financial funding to Thales Alenia Space for the research and prototype development of the Stratobus. There is rapid growth of the industrial sector in Asia Pacific, primarily in countries such as China and India, due to high availability of low cost, skilled labor and raw materials. Owing to this, there is high demand for outsourced activities, which require the internet for functioning efficiently and maintaining connectivity to the clients and their business units across a large geographical area. Furthermore, there is rising demand for eco-friendly technologies that rely very less on conventional power sources. Solar-powered HAP vehicles can massively reduce the dependence on traditional fuel sources and is anticipated to drive the high altitude platform market in the long-term. These vehicles require high initial costs for the manufacturing and continuous recurring costs for the maintenance, posing a challenge to the high altitude platform market growth. High exposure to wind speed ranging more than 95 mph can result in substantial damage to the technologies. The development of these technologies requires a very skilled workforce with specialized training in the development and the maintenance of these systems. The current trend of solar-powered technologies is a major driver for the UAV market. These systems can provide massive savings in term of fuel costs while reducing the CO2 emissions. Tethered aerostat systems are anticipated to hold the largest high altitude platform market share due to its large number of applications such as surveillance, information gathering, environmental research, disaster management among others. The United Coast Guard and Customs Service faced major issues pertaining to cross border drug trafficking along the Southern borders. To combat this issue, TCOM L.P was awarded a contract for the development of their 71M aerostats that are equipped with advanced radar payloads and can provide persistent long-range surveillance. Surveillance applications dominate the high altitude platform market owing to military and public safety adoption. Airships and UAVs allow the detection and identification of criminals with the aid of advanced aerial imaging and video analytic systems to match facial features of the criminals to the databases. These platforms can carry payloads ranging to above three tons and cover very large areas. The communication segment in high altitude platform market will witness growth due to projects imitated by prominent IT companies such as Google and Facebook. Google has launched various projects such as Skybender and Loon for the provision of internet services to remote and underserved locations displaced across the world. Wireless communication technology is anticipated to exhibit massive growth to a large increase in smartphone and portable device usage, making HAP stations indispensable in the long-term. Improvements in LTA technology has aided the growth of the high altitude platform market for military applications. The capabilities of these systems are not limited to only surveillance purposes. The platforms are capable of carrying massive payloads and used for the transportation of armaments and weaponry. In 2015, China tested a new helium-filled stratospheric airship, Yuanmeng. The system designed and built by Beijing Aerospace Technology Company, is capable of operating for 48 hours continuously. 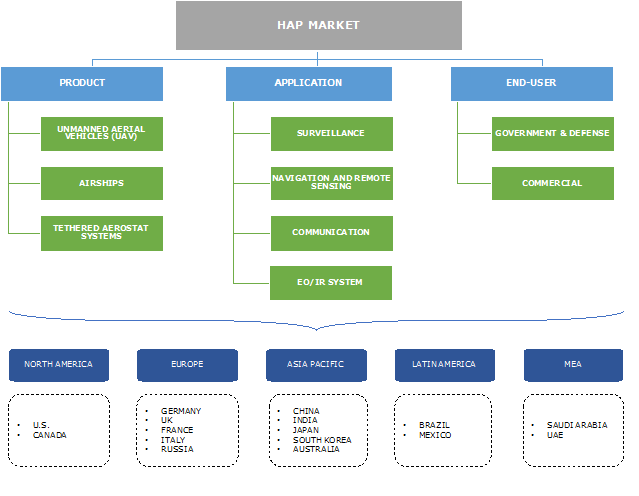 The telecommunication segment of the HAP market is projected to have high growth during the forecast timespan. Companies operating in the medical sector are investing highly in R&D activities for the development of telecommunication and navigation services. HAPs used for telesurgery provide medical aid in locations that do not have direct access to medical practitioners and are highly instrumental in increasing the life expectancy of the rural population and soldiers and military officials situated in remote locations. 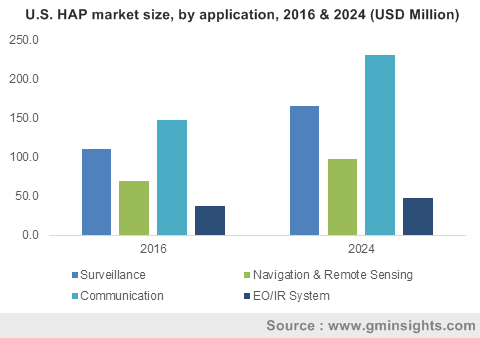 The U.S. high altitude platform market is anticipated to dominate regional HAP industry, while Asia Pacific is also projected to experience rapid adoption of the technology for telecommunication and commercial purposes. The military in the region is the largest customers of these equipment, aiding in the high adoption of these technologies. At present, government bodies are acquiring systems such as UAVs for testing purposes but have long-term implications as the success in testing could result in the large-scale adoption of these systems. The U.S. government involvement in foreign conflicts is reducing with the effort being concentrated internally and across its neighboring borders. This is contributing to the massive increase in aerospace and defense applications for internal applications such as homeland security and border patrol. The economic boom in the South-East Asian countries is contributing to the high growth of the HAP market. Outsourcing of various business operations requires continuous connection to the internet and other communication facilities. Disruption in connectivity can result in massive financial losses for regional players. Additionally, the consumers in the region are also seeking high speed broadband services and wireless connectivity which at lower rates. The vendors in the high altitude platform market include Aerostar International, Inc., Avealto Ltd., TCOM L.P., Israel Aerospace Industries Ltd., Lindstrand Technologies Ltd., Raytheon Company, Thales Group, Airbus SE, Lockheed Martin Corporation, and Rafael Advanced Defense Systems Ltd. A prominent strategy amongst the HAP market players is entering into partnerships with other players. For instance, the company had entered in to a partnership with Lockheed Martin for the launch of UAS products such as the Global Observer. AeroVironment, Inc. acquired a contract of USD 2.5 million contract for the continuation and expansion of their Blackwing UAS Program which are anticipated to be delivered by May 2018 to the U.S. Army. HAP enables governments to expand their defense technology portfolio and use advanced technology systems for surveillance and data relays across uneven terrains such as large water bodies which are relatively hard to reach by terrestrial towers. These platforms, situated in the stratosphere have lower latency issues than satellite systems due to closer placement and line-of-sight. Although the market comprises of very few players, the competition is moderate owing to the large-scale collaborations between the existing players for the development of new technologies. The government is a major consumer of these products owing to their applications in surveillance and navigation. The manufacturers in the high altitude platform market generally partner with large government agencies such as the US Military and NASA for testing and prototype development. In May 2016, AeroVironment announced that it was partnering with SmartC2 and NASA for the testing and demonstration of Unmanned Traffic Management (UTM) Technology Capability Levels (TCL) 2 flight.